Art. 1 The race is only open to active members of Rotary International or Rotaract who are member of the Fellowship Cycling to Serve. They may not have, however, a licence of any organisation affiliated to the UCB, as a professional. Art. 2 The competitors should have an acceptable bicycle for racing and wear appropriate cycle clothing. Art. 3 The entry fee of € 50,00 per competitor is to be paid before the race. Art. 5 There will be a mass start in each category. Competitors are racing as individuals. Helping fellow competitors is prohibited. Art. 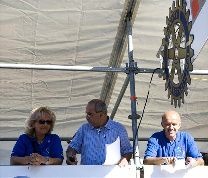 6 The race will be under the control of the race-director, appointed by the Rotary Club Mayenne (F) . The race-director's decision is final. Art. 7 Lapped competitors may be asked to leave the race, if considered necessary by the race-director. Art. 8 The competitors must present themselves at the check-in at least one hour before the start of the race, with their identity papers and Rotary membership card. The amounts will be deposited to the charity fund of the club during the World Championship weekend. Art. 10 An approved Safety -helmet is obligatory. Art. 11 Numbers must be pinned on the left-hand hip. Art. 12 The event insurance covers only the statutory obligation with reference to public liability. Art. 13 Clubs and supporters are free to donate prizes.